I couldn’t wait to make this Crock Pot Jamaican Jerk Chicken Soup recipe. I have been wanting to make this crock pot soup recipe since I made my Crock Pot Jamaican Chicken with Coconut Rice recipe. 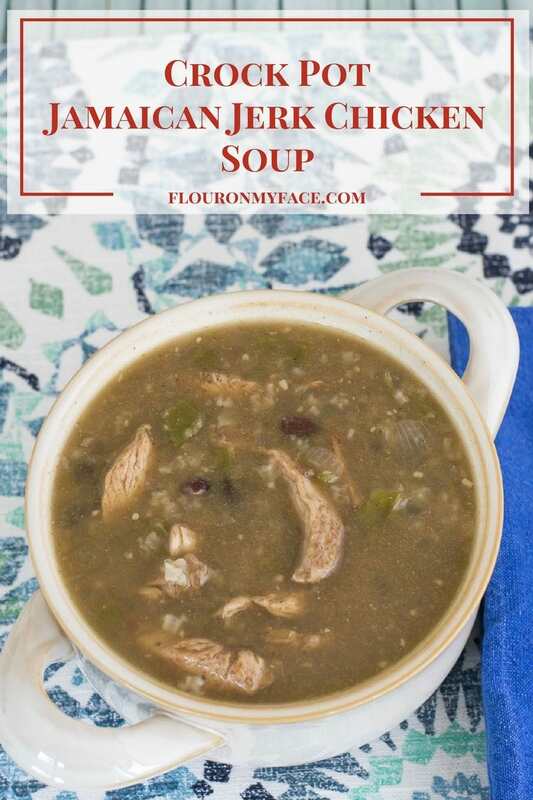 Crock Pot Jamaican Jerk Chicken Soup has all your favorite Jamaican Jerk Chicken flavors served up in a nice big bowl of soup. It is nice and spicy with the bold flavors of the Caribbean from a Jamaican Jerk seasoning blend. The flavors you would expect in jerk chicken. 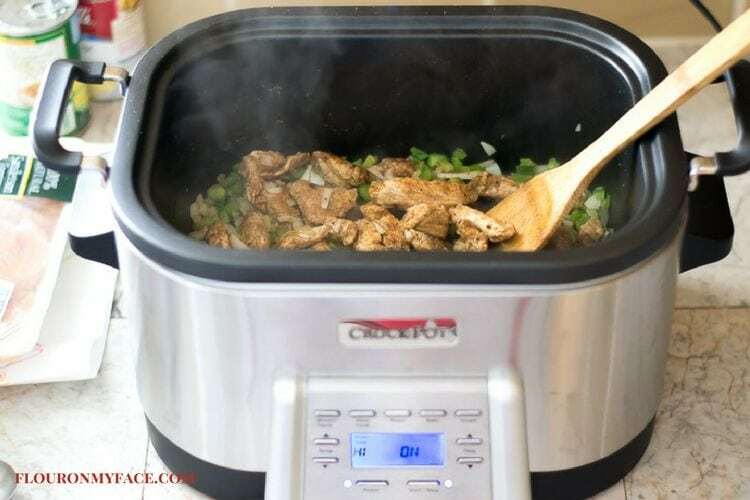 You can control how hot and spicy this Jamaican Jerk Chicken Soup recipe is by the amount of Jamaican Jerk seasoning you add to the crock pot. I started out with 3 tablespoons but I really love bold and spicy flavors so at the end of the cooking time I added another teaspoon of the Jamaican Jerk seasoning to kick the heat up. How to brown boneless chicken in the new Crock-Pot 6-Quart 5-in-1 Multi-Cooker. To say I was excited to start playing with my new crock pot is an understatement. I seasoned the boneless chicken with the Jamaican Jerk seasoning and added a little olive oil to the multi-cooker. Then I browned the chicken in my new Crock-Pot 6-Quart 5-in-1 Multi-Cooker. No need to dirty a skillet for my crock pot recipes that need the meat browned! Mama has a new toy to play with and this is the first of many crock pot recipes I will be making in this new crock-pot slow cooker which will brown/saute, slow cook, roast, bake, and steam. Disclosure: Crock-Pot sent me this new Crock-Pot Multi-Cooker which I will be using in a few upcoming sponsored posts. This Crock Pot Jamaican Jerk Chicken Soup has not been sponsored by Crock Pot but I just couldn’t wait to share the news about this great new appliance. This new slow cooker is going to make my life so much easier. Now I can brown meats or saute vegetables for my crock pot soup recipes then switch the setting to slow cooker and we are off a crocking. All without using the stove and dirtying a skillet. Oh yeah! I can wait to try making a crock pot dump cake recipe in it to see if it will brown the top of those delish ooey gooey dump dessert recipes. 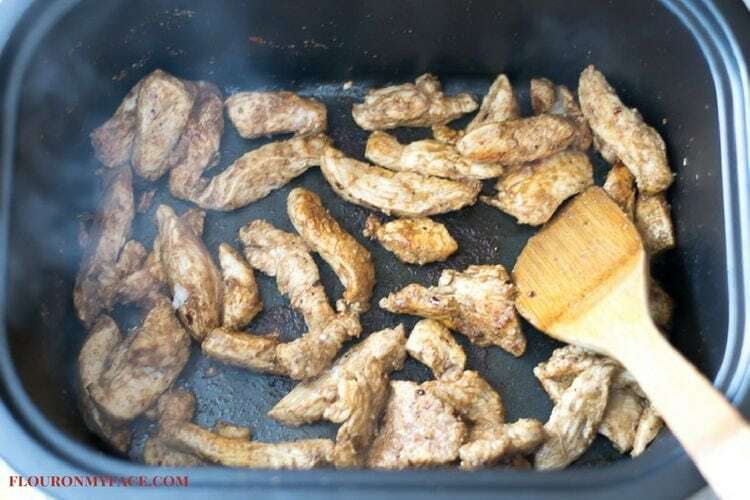 Toss the chicken strips with 3 tablespoons Jamaican Jerk seasoning and set aside. Heat the olive oil in the new Crock-Pot 6-Quart 5-in-1 Multi-Cooker set on the browning setting or a skillet on the stove. Add the seasoned chicken to the multi-cooker or skillet. Brown for about 3 minutes, tossing occasionally. Add the onion and bell pepper to the multi-cooker or skillet. Toss for about 3 minutes. If using the new Crock-Pot 6-Quart 5-in-1 Multi-Cooker switch the setting to slow cooker and set the time to 3 hours. If using a skillet turn your crock pot slow cooker to low and carefully transfer the contents of the skillet to the slow cooker. Add the minced garlic, cumin, pepper, salt, and 1 teaspoon of jerk seasoning to the slow cooker. Stir to combine. Add the chicken broth, cover and cook for three hours on low. After 3 hours increase the heat to high and add the black beans and rice to the slow cooker. Cook an additional hour or until the rice is tender. Add the onion and bell pepper to the multi cooker or skillet. Toss for about 3 minutes. Stir to combine. Add the chicken broth , cover and cook for three hours on low. 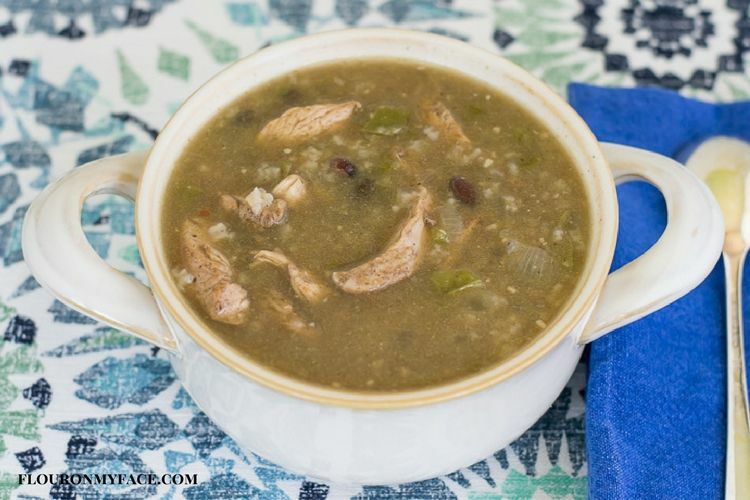 Looking for more crock pot recipes like this Crock Pot Jamaican Jerk Chicken Soup recipe? Head over to my crock pot recipe page because the list of crock pot recipes is growing. Sounds great! I need to crock something today! Thanks for linking up to Merry Monday! Pinned! Have a great week! I love all the flavors going on here! I am loving soups lately and this sounds great! This looks yummy and definitely something I haven’t had before! The instructions don’t appear to indicate when the chicken broth should be added into the crockpot. I assume it’s right after you add the chicken, minced onion…etc., but wanted to confirm? Thanks for this recipe. Gonna try it this weekend. Sorry about that add the chicken broth in step 9.